In the last couple months I started watching MythBusters almost every night. They've been on the air long enough that almost all the episodes are new to me. I was in the Apple cafeteria today eating lunch, when I see this guy. The guy looks familiar, like maybe a guy I'd seen at Apple before. I look a little more carefully at him, and think that he looks a lot like that guy from MythBusters. You know, that guy with the funny French hat. 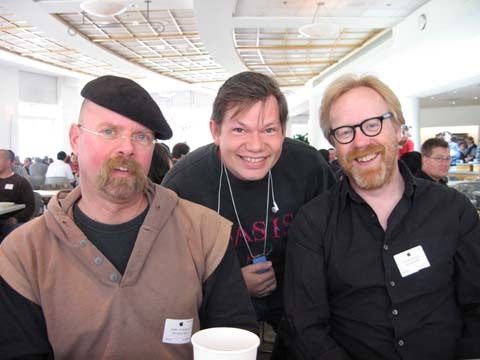 Then I look at the guy beside him, and quickly realize that it's the MythBusters guys. I call my girlfriend right away since we watch TV together, and she gets excited for me. She insists that I get a picture with them and get an autograph. I didn't have a camera or anything but my business card for them to sign, but I didn't want to disappoint my baby. So I ask one of the guys at their table who I saw had a camera if he could take a photo and email it to me, and asked the guys if I could get a picture with them. I noticed I wasn't the only one to ask for a photo with them. I don't know if they get recognized wherever they go, but they're very popular at Apple - "nerd central". Any clue why they were on campus?